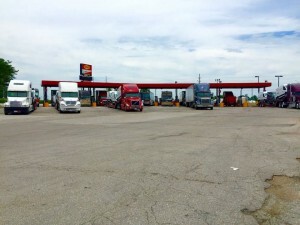 Heading across hilly Interstate 70 through Missouri there are a lot of truck stops & rest areas for truckers to pull in. There are also a lot of trucks along this lane and every place you stop will be busy. 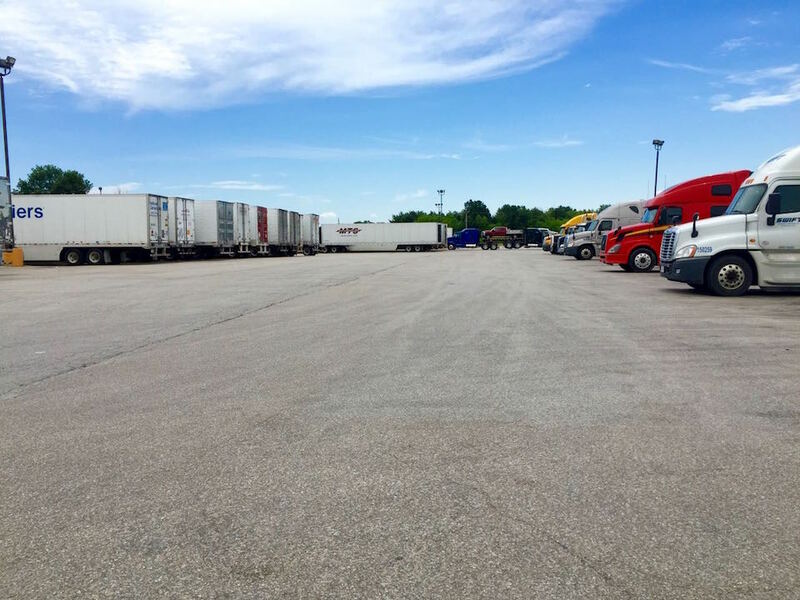 Flying J’s Warrenton location has what seems to be a huge parking lot. 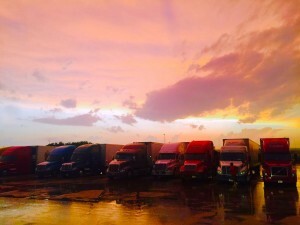 They advertise 200 big rig parking spots and if you’ve ever been there, you know truckers probably get a lot more than 200 trucks parked in there at night. 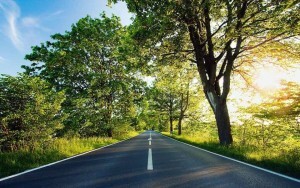 It’s a tight parking lot – mostly paved but older & broken with a lot of ruts in the asphalt from years of heavy traffic. All the spaces are straight-in spots. Lighting at night is about average but could be brighter. I’ve always seen a lot of garbage in this parking lot. There’s an odor of garbage drifting into the truck parking area which seems to come from the garbage dumpsters. Also, near the back row of parking (straight back from the fuel islands) is a waste treatment area, and the aroma of that is nauseating. I’ve also seen several trucks get hit by other trucks pulling through or backing in. TSG Tip: When parking next to another truck, try to back in on the right side of that truck. Reason being; as the next driver is parking to the right of your truck, they can see your rig better (if they aren’t blind-side backing). This can minimize the risk of their trailer hitting your tractor as they back in. Then, there’s the combination panhandler-hitchhiker-lot-lizard… the young woman who claims to need money for college or a “warm place to sleep tonight because it’s freezing outside”. If you care for your safety, your family and your career, don’t let her in the truck. This is the second place in the St. Louis area I’ve had my truck door knocked on in the middle of the night by a stranger. Don’t let them in. For that matter, don’t even open your window! 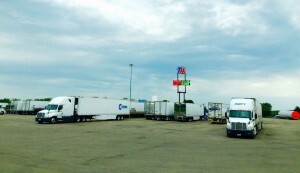 The 12 diesel lanes (equipped with DEF) at this truck stop are always very busy. Plan to wait in line a few minutes if you are going to fuel here. 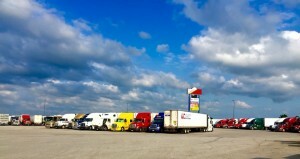 This stop has good fuel prices and a good location. I’ve always noticed a lot of trash around the fuel islands here. I’ve slipped a number of times in puddles spilled diesel fuel, so be careful. Once you get diesel on your boots or shoes, it’ll be there a while and makes the steps into your truck dang slippery! Usually, the garbage cans are crammed full and the water (if there’s water) for windshield washing is dirty. What I like least about this stop’s fuel lanes is how they’re laid out at an angle. After fueling, the pay lanes narrow together, making it really tight getting out. 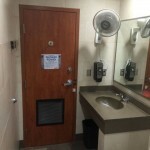 You’ll find 2 sets of men’s & women’s restrooms inside this Flying J, like many of the FJs with a Denny’s in them. 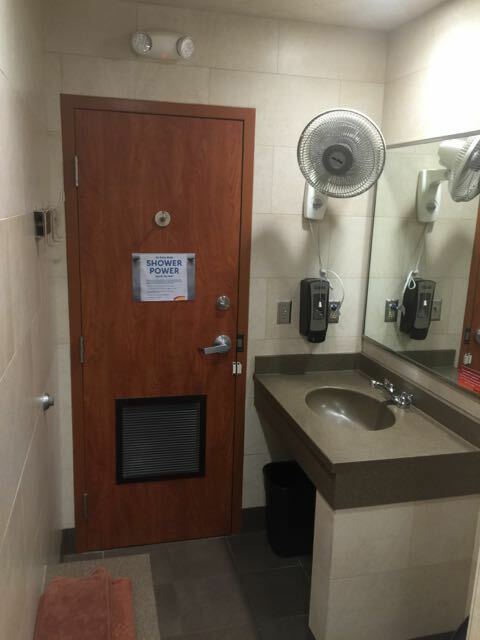 The restrooms are adequate in size for a truck stop this size. This is a really high-traffic store but even so, I’ve never been impressed by cleanliness here. 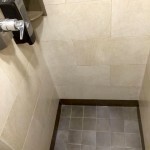 The restrooms are usually pretty dirty – in the stalls, on the floors and around the sinks. 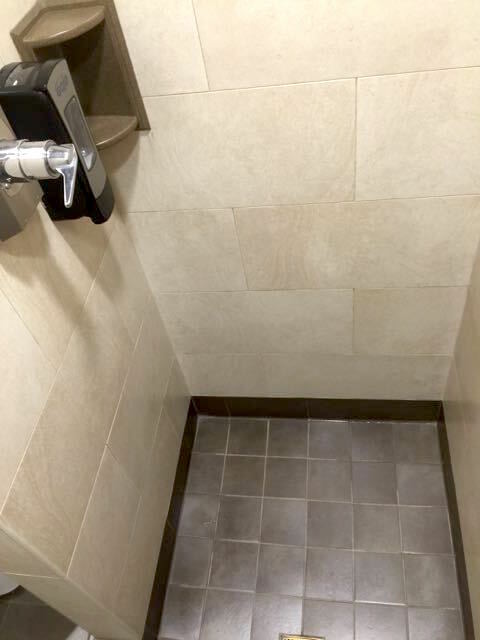 It just doesn’t seem like maintaining the restrooms is a priority here. 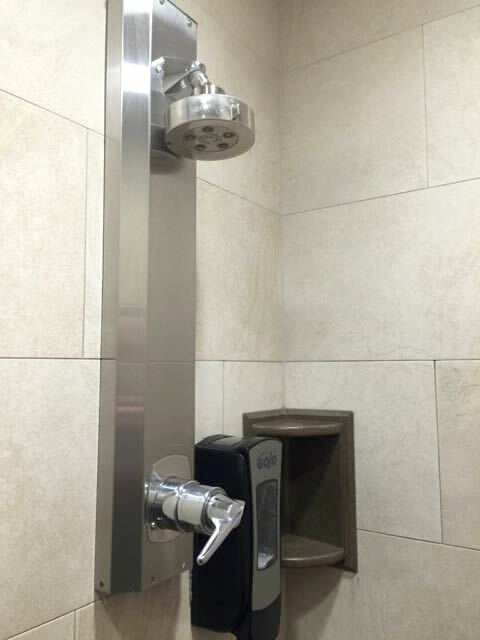 The odor which makes truck stop restroom jokes not-so-funny is definitely present here. 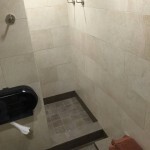 Flying J has 14 shower rooms available at their Warrenton location. 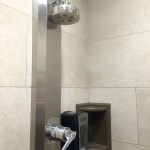 Honestly, the showers are pretty average in size and features for a Flying J but like most of this store, they just aren’t very clean. I’ve eaten at the Denny’s here twice. The service has never been very good and the food isn’t as good as the service. First, there’s the wait for a hostess to seat you. If you’re a non-smoker (or worse yet, former smoker like me), you might not like the fact that there’s a smoking section a couple paces from the non-smoking section. The only way you can tell the difference between the sections is who’s smoking and who isn’t, but you can smell the smoke through most of the restaurant. Inside the main store you’ll find a hot deli with pizza & fried food enough to fill up your tummy and clog your arteries. Personally, I preferred the greasy pizza in the hot case over the chicken fried steak in Denny’s – and I didn’t have to wait as long. 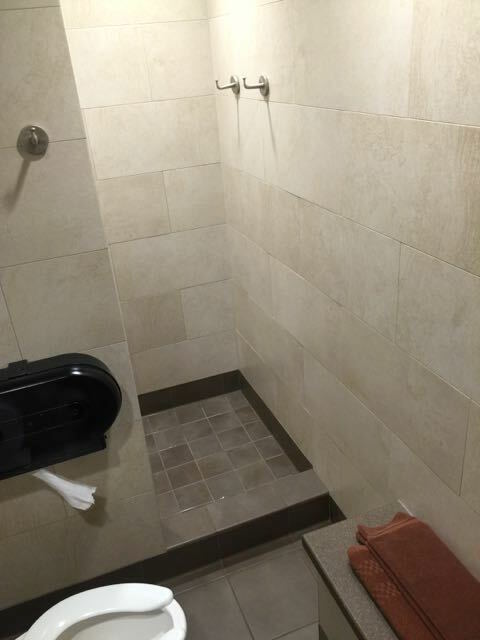 You’ll find a CAT scale outside, a driver’s lounge inside and a laundry room. WiFi is available but like most Pilot/Flying J locations, it’s so unbelievably slow it’s not worth wasting your loyalty points on or paying for.